Let me rephrase: I absolutely love any and all cookbooks that have color pictures. I really need to see what it is I’m supposed to make, otherwise it just isn’t as appealing. The best cookbooks are those that have giant, glossy images of each and every recipe. Doesn’t matter whether it’s paleo or not, if there are recipes and pictures I will read it, and most likely I will love it. I wish I could buy a new cookbook each and every day, but since I can’t I usually end up reading through the cookbooks on my shelf, the cookbooks that I’ve practically memorized. Sadly, since leaving grains and most sugars behind I no longer cook from my cookbooks too often. I drool over them, read and learn from them, but then place them back on their shelf where they sit until the next time I have the urge to read through one. I don’t think that’s how a cookbook’s life should be. I think they should be loved and used, they should be worn and splattered on, they should not collect dust. I can think of no better compliment to the chef, who put their time and love into creating the cookbook, than bringing their recipes into your family’s kitchen. Though bringing some of these recipes into my kitchen may require a bit of tweaking, I’ve been making a much bigger effort to cook from my cookbooks. I thought it would be fun to share these paleo versions with you all. Up first, a recipe from on of my most favorite healthy cooking bloggers/authors, Heidi Swanson from 101 Cookbooks. Her second book, Super Natural Every Day, is truly a beautiful book filled with a ton of vegetables and fresh recipes. Before going paleo, I loved her use of non traditional grains, such as amaranth and millet. Nowadays, I focus on her recipes featuring local and seasonal produce. Her rendition of traditional potato salad had me at first sight. 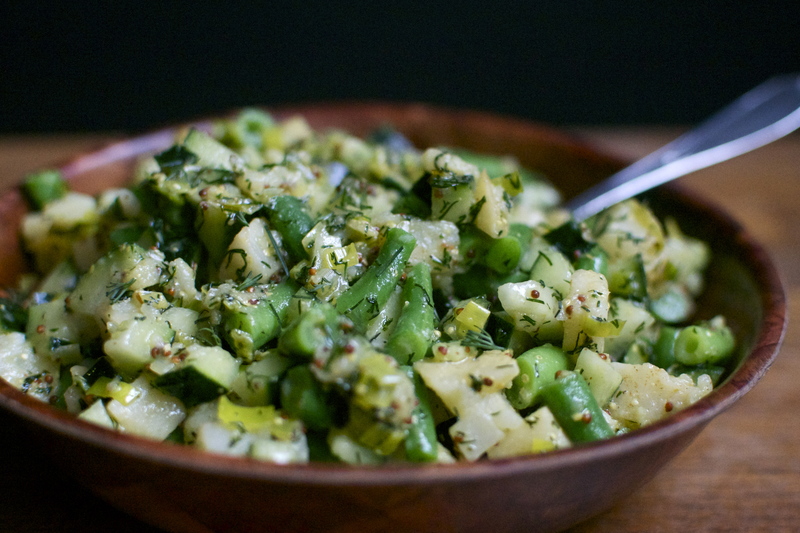 Packed full of vegetables tossed in a bright mustard dressing just sounded too yummy to pass up. Though potatoes are considered all right in moderation by some in the paleo community, including myself, I wanted to sub out the potatoes for another vegetable. 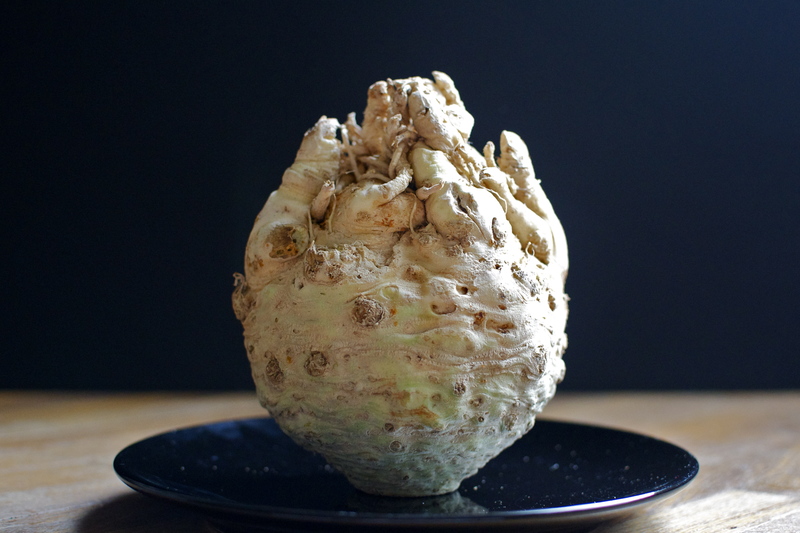 While at the farmer’s market last week I stumbled across celeriac, or celery root. After a quick google search I brought home a few of them and couldn’t wait to try them out in this salad. Best decision of that day. Bring a pot of water to a boil. Add a generous amount of salt and add the celery root. Boil for 10 minutes. One minute before the celery root is done cooking, add the green beans to the boiling water. Drain them both, rinse with cold water, and set aside. In the meantime, prepare the dressing by whisking together the mustards, vinegar, and 1 tbsp olive oil. Add a pinch of salt and fresh cracked pepper and set aside. In a large skillet, heat a drizzle of olive oil over medium-high heat. 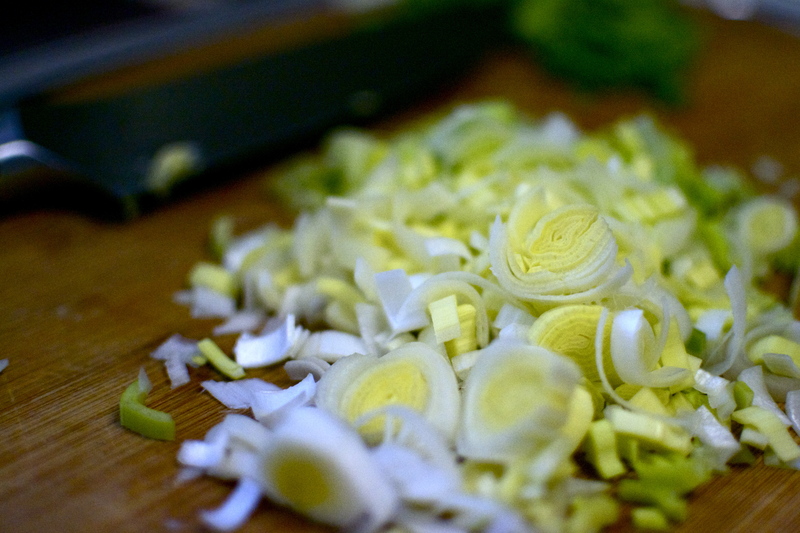 Add in the dill, stir, and then add in the leek with a big pinch of salt. Stir in the leek and saute about 5 minutes, until the leek is golden. 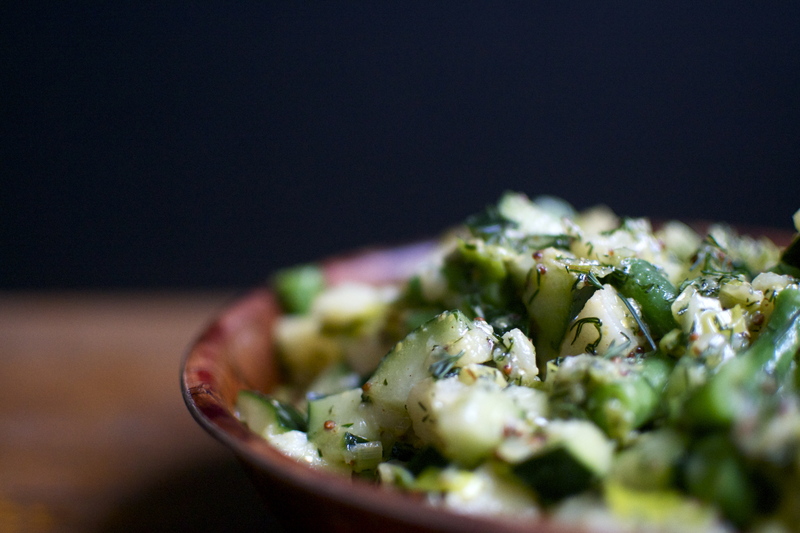 In a large bowl, gently toss together the celery root, green beans, cucumber, leek and dill mix, and most of the dressing. Taste, and add the rest of the dressing if desired. Yum, those pictures are gorgeous. Quick question, does celery root actually taste like celery? Thanks!! 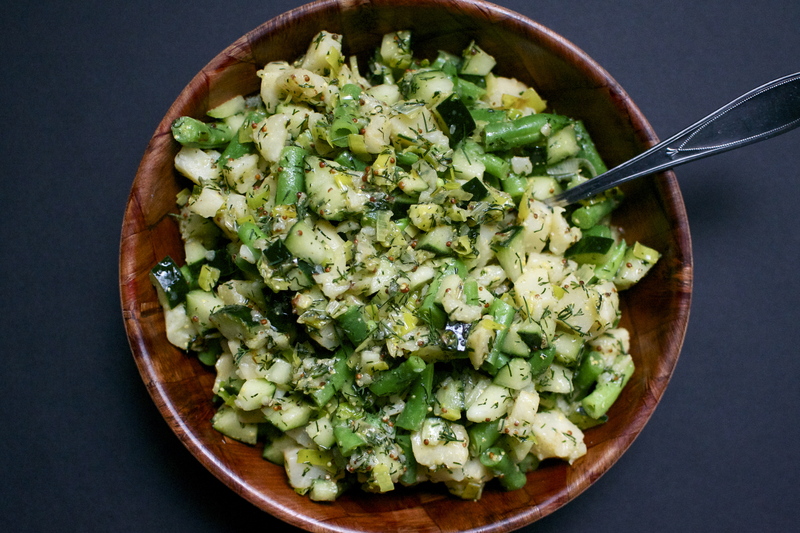 It doesn’t have a strong celery flavor, especially when its with a ton of other flavors like in this salad. I’m really excited to try it out as hash ! Funny, because I feel like celery root does have a strong celery flavor. At least it did the times I’ve made it, but I have only made it as a simple mash with butter, salt and pepper. I really like both celery and celery root! I’ll have to try this recipe. I actually have a celery root in my fridge right now! I didn’t try it all by itself though!! So I totally believe Alisa (paleo in pdx) !! In this recipe, though, it doesn’t have a strong celery flavor. Nice! I usually make “mashed potatoes” out of celery root, but this time I’ll try something new. Thanks for the recipe! Yum! such a good idea!